Altherm Yamaha Official WMX’s Courtney Duncan dominated the second round of the FIM Women’s Motocross World Championship on the rut-strewn clay of Agueda, Portugal to claim her first round victory of 2018 and the WMX Championship Red Plate as the new series leader. Joining the ‘Kiwi Girl’ on the podium, No Fear Yamaha Official WMX’s Nancy van de Ven put in two solid races for third overall, while the defending champion MXFonta Yamaha Official WMX’s Kiara Fontanesi bounced back from the adversity she faced in Race 1, where she finished 7th, for 3rd place in Race 2 and 4th overall. The track in Agueda had been battered by rain across the days leading in, which made the typically hard-pack surface very soft and technical. 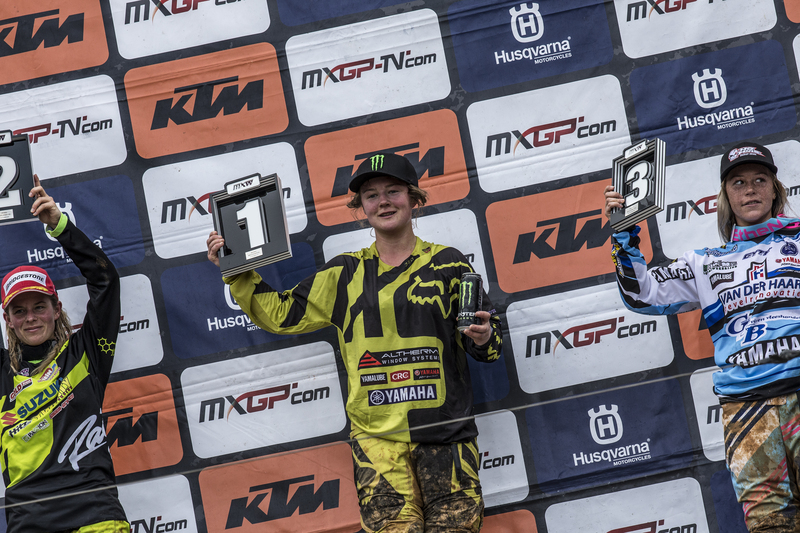 Fresh off her first race victory in the final race at the opening round in Trentino, Italy, Courtney Duncan stamped her authority on the 2018 WMX Championship with a convincing double race win in Portugal. In the opening race of the weekend, Duncan got off to a blistering start, leading van de Ven around turn one, while Fontanesi was left for dust and forced to charge her way through the field. What Fontanesi lacked in speed off the gate she made up for on the track as she impressively charged her way up into the Top-10 before the end of lap 2. After 10-minutes of weaving her way through the pack, the defending champ made light work of the championship leader, Larissa Papenmeier, before hitting a kicker on a short and sharp decent, which caused her to crash. Following a quick remount, the Italian was resurgent and managed to fight back to 7th place. Meanwhile, Duncan remained superior in her craft on the rough and rutty red clay as she led every single lap to win by 13-seconds over van de Ven who crossed the line in 2nd place. After overnight rain, the girls lined up first thing this morning ready to brave much sloppier conditions than they raced in yesterday. Duncan got off to another good start and chased Papenmeier around turn-one with Fontanesi in her wake. While frantically pulling tear-off’s, after taking a face full of roost, Fontanesi pinned it around the outside of Duncan for 2nd. Duncan’s team owner is none other than Josh Coppins, former MX1 vice world champion, Yamah ace, and fellow ‘Kiwi’ legend and is always advising her to be patient and bide her time, as a lot can happen over the 20 minute plus 2-Lap course of the race. After two laps of patiently sliding around in the mud, Duncan found some lines that worked well and she set the fastest lap of the race before executing a text book pass on Fontanesi by charging up the inside and pushing her wide. The ‘Kiwi Girl’ then went on to chip away at the lead of Papenmeier and eventually used the power of her YZ250F to make a pass by pinning it around the outside line. Papenmeier did get squirly, which made for a heart-stopping moment as the two rubbed plastic. Fortunately, they both managed to keep their bikes on two-wheels with Duncan asserting her place at the front of the field. Wet conditions always makes for an interesting race and more often than not, it’s a battle of survival. Fontanesi & van de Ven both stayed out of trouble and put in strong rides to finish 3rd and 4th, respectively, which was enough to give van de Ven her first podium finish of 2018, with 3rd overall. As the clear-cut fastest rider this weekend, Courtney Duncan was masterful on the wet and muddy clay. Having won three races, from four, this season, she will go into the third round of the championship with a 3-point lead over Larissa Papenmeier. Nancy van de Ven has moved up to 3rd place in the WMX World Championship standings with a 6-point buffer over Kiara Fontanesi in 4th. Yamaha extends its lead in the WMX Manufacturers Classification, and now leads by 10-points.